The heart and soul of historic racing in Northern California, if not the world. Your webmaster remembers Love, of Berkeley, CA, racing this car in 1964 in fender-banging SCCA races in A/SR against mid-engined competition. 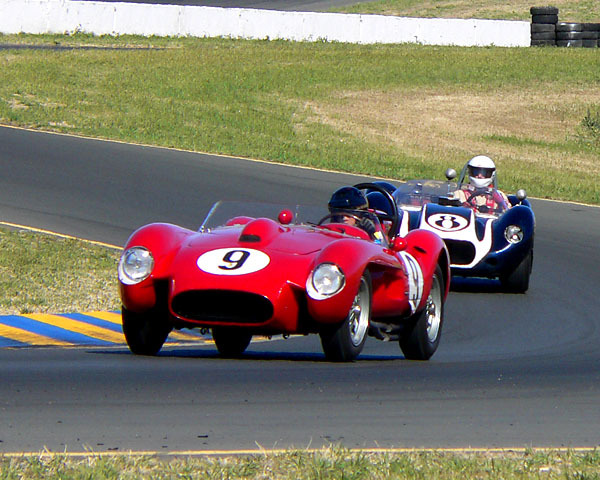 He also won his race at the first "Monterey Historics" in 1974 and has competed there every year since. He leads Andy Leonard, of Topanga, CA, through Turn 8 in his 6500cc. 1959 Hustler SR.